Sabrina Reynolds' 2019 collection of leather handbags shines in our final issue of 2018! Read her rebirth story by Marshelle Haseley on page 17. Then island hop with us to Grenada as we shine the spotlight on Belmont Estate- a true foodie's paradise. Kaleidoscope makes a colourful splash back into to the Jamaican market- learn more about their future plans for the vibrant island. 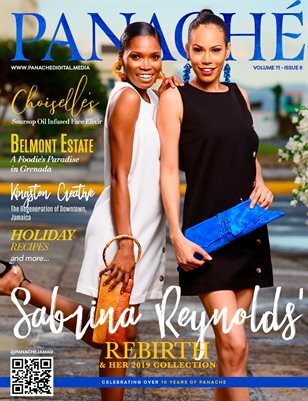 Get wooed once more with Miami Temptations as you check out Choiselle's new soursop oil infused face elixir; amazing holiday recipes and more! Happy Holidays from #TEAMPANACHE!